The 96-room Palihotel opened last year in a rehabbed 1895 building in downtown Seattle. The Johnson Partnership senior associates Howard L. Miller, Steve M. Campbell and Ellen F. C. Mirro have acquired the Seattle architecture firm from Larry E. Johnson, who founded it in 1979. In a press release, they said the transition to a limited liability corporation was prompted by Johnson’s desire for the business to continue as he moves toward retirement, and also acknowledges the commitment of senior employees. The new owners are now principals and Johnson is principal emeritus. Terms of the deal were not released. The six-person firm provides general and historic preservation architecture and historic resource services. The office is at 1212 N.E. 65th St. 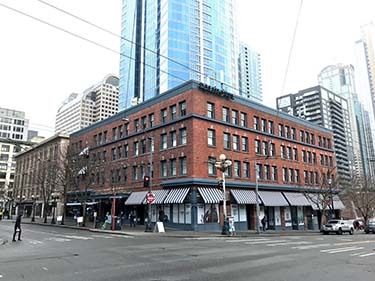 Recent projects include preservation planning for the Palihotel (the former Colonnade Hotel/Gatewood Apartments) at First and Pine in Seattle. That work included the city landmark nomination, listing on the National Register of Historic Places, and assistance with local landmarks approvals and federal tax credits. Gensler was the architect, Coughlin Porter Lundeen the structural engineer and JTM Construction the general contractor. The Johnson Partnership is designing an expansion of Lewith Home, which provides housing in Lake Forest Park for low-income women. Also on the team are Swenson Say Faget, structural engineer; Wetlands Resources, environmental consultant; Eastside Consultants, civil engineer; and Geotech Consultants, geotechnical engineer. Ravenna-Cowen North is a Designated Historic District! Washington State’s newest historic district is Ravenna-Cowen North in Seattle! This historic district, roughly bounded by NE 65th Street on the north, Ravenna ravine on the east, Ravenna and Cowen Parks on the south, and 12th Avenue NE on the west, was unanimously approved by the WA Advisory Council for Historic Preservation (ACHP) on June 29, 2018. The district has been added to the Washington Heritage Register, which includes historic and cultural properties that have been recognized for their unique contributions to Washington’s heritage. The ACHP also unanimously approved recommending the district for listing on the National Register. The WA Department of Archaeology and Historic preservation (DAHP) will send this request and documentation to the Keeper of the National Register in Washington DC, and we’ll provide another update after that. The Ravenna-Cowen North Historic district includes 443 homes, most constructed prior to the early 1930s, with a districtwide average construction date of contributing resources of 1918. This district exhibits a special character, scale and setting that represents a period of population growth and housebuilding resulting from the excitement generated by the Alaska-Yukon-Pacific Exposition at the State University (now the University of Washington main campus) grounds in 1909 and lasting through the devastating economic Great Depression of the late 1920s and 1930s. 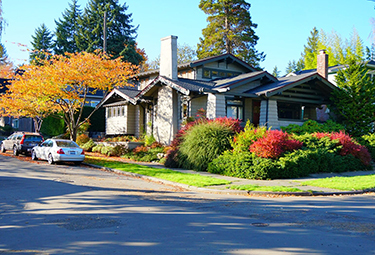 Ravenna-Cowen North Historic District’s period of significance begins in 1906, with the anticipation of the Alaska-Yukon-Pacific Exposition, and runs to the early 1930s, with only a handful of homes built from the 1940s through the 1960s. Ravenna-Cowen North Historic District exhibits the range of residential architectural styles prevalent during one of Seattle’s greatest population growth periods. Styles mainly include Craftsman, Tudor Revival and Colonial Revival styles; many designs were taken directly from pattern books and kit home catalogs dating from the early 1900s to the 1930s. Most of the district’s residences are relatively modest. The existing cohesive neighborhood conveys a unique feeling in place and time. The application for historic designation was prepared by the Friends of Ravenna-Cowen, an all-volunteer 501c3 non-profit organization whose purpose is “To preserve and protect the heritage of the Ravenna-Cowen neighborhood as a community resource for all.” Larry and Lani Johnson, of The Johnson Partnership, were part of the hardworking team, and Larry was the lead Historian for the effort. Larry & Lani attended the June 29 ACHP meeting on behalf of the Friends of Ravenna-Cowen. PS – Larry & I have collectively contributed more than 900 pro bono hours to this project in 2018!! The entire FORC team put in a lot of time. Steve Campbell prepared the maps. This craftsman bungalow is typical of the style and quality throughout the district. This map shows the district boundaries and the individual properties within. We were recently part of a team for an adaptive reuse project in Pioneer Square, for which we served as historic resources- and preservation consultants. The aim of adaptive reuse is to repurpose an old building or site as an alternative to demolition and new construction. This year Hudson Pacific Properties (HPP) will complete an ambitious redevelopment and historic preservation of the 95 So. Jackson Building located in Seattle’s Pioneer Square neighborhood. Project scope included structural upgrades to the unreinforced masonry construction, a full seismic upgrade, all-new building infrastructure (including mechanical, electrical, life safety, energy management and vertical transportation systems), and finally preservation and restoration of the building’s historic exterior façade. 95 So. Jackson was constructed in 1909 as a warehouse facility for the Schwabacher Hardware Company, a major regional supplier of hardware and building materials at the turn of the century. Located immediately adjacent to what was then known as Railroad Avenue in Seattle (now known as Alaskan Way), the building’s original northern, southern and western facades were punctuated by multiple one and two-story openings. These served as warehouse loading bays, allowing for the efficient transfer of heavy materials between rail cars and the interior of the building, as well as serving as shipping bays for retail distribution. The building was originally designed by Saunders & Lawton, a prolific architectural partnership active in Seattle between 1898 and 1915. The original builder was H.D. Stewart, a prominent local builder both before and after the Great Seattle Fire. The building operated as a warehouse facility for more than 71 years until 1980, when the R. D. Merrill Company purchased the building and converted it as part of the Merrill Place development. Since the Merrill conversion, portions of the building served various functions including retail, general office, a performance venue and a U.S. Postal Service distribution facility, until HPP acquired the property in 2014. 95 So. Jackson is an excellent example of early 20th century mill construction and was one of the original “working buildings” on Seattle’s young industrial waterfront. It represents the extensive contributions made by the Schwabacher Hardware Company as a critical resource to the city during a period of rapid expansion, and further serves to define the early development of Seattle’s historic working waterfront. The design of the building exemplifies the work of Saunders & Lawton, whose notable contributions to the development of Seattle also include the Dunn Tin Storage Warehouse (now the Old Spaghetti Factory), the McKesson & Roberts Warehouse (now FX McRorys) and the Westland and Polson Buildings. Over the years, and especially in the 1980s, most of the fenestration of the original warehouse design was dramatically altered on the primary façades of the building: many doors, windows and loading bays were obscured by non-original infill. The proximity of the Alaskan Way viaduct caused some damage in 1983, when a bus ran into the building. The strategy for rehabilitation was to strip away all of the non-original in-fill to reveal the original composition of the 1909 design, embracing the original transparency of the large loading bays. Consistent with the Secretary of Interior’s Standards for Historic Preservation, existing historic elements of the building were retained and rehabilitated, while new interventions were differentiated through the thoughtful use of modern materials and modulation. Existing historic details–including windows, industrial coiling door headers, steel corner guards, riveted steel lintels and original “coal chute” clerestory hopper windows–were preserved in place, and served as inspiration for new design elements on the western and northern façades. Modern glazing without visible muntins was utilized to mimic the light and transparency of the original loading bays, and salvaged brick and timbers have been repurposed throughout the building. The original submittal for the proposed project design received unanimous approval from the Pioneer Square Preservation Board. Our role consisted of assisting with administration to obtain the Certificate of Approval (COA) from the Pioneer Square Preservation Board, obtaining secondary COA for HVAC systems not covered in the original submittal, and advise on the Secretary of the Interior’s Standards for Historic Preservation. Ellen recently enjoyed a family vacation on the east coast, and took the opportunity to learn more about the history and architecture of New Jersey and New York. First stop was the Cooper Gristmill in Chester, New Jersey. Built in 1826, the restored building is one of the only extant water-powered mills in the state. A volunteer demonstrated the mill’s interior workings, including the massive water wheel. Next stop was Waterloo Village in New Jersey. Built as a canal village, it is now a protected historical park, with a working smithy, a gristmill, and other interpretive centers that illustrate daily life in 1872. The Finger Lakes region of New York was next, with two particularly interesting sites. The first was the Sonnenberg Gardens and Mansion in Canandaigua. The house was the country home of wealthy banker Frederick Ferris Thompson and his wife, Mary Clark Thompson. It was designed by prominent New York City architect Francis Richmond Allen. Even more famous than the house are the restored gardens, which were designed by landscape architect Ernest W. Bowditch. The second site in the Finger Lakes area was the Seneca Bark Longhouse and Seneca Art & Cultural Center in Ganondagan, two sites that form an interpreted landscape exploring the culture and history of the Seneca and Haudenosaunee peoples and the village of Ganondagan. The longhouse has been faithfully reproduced from archaeological evidence dating back to the seventeenth century. The Seneca Art & Cultural Center opened in 2015 with an award-winning design by Francois de Menil in conjunction with DeWolff Partnership architects. Seneca Art & Cultural Center at Ganondagan. Designed by Francois de Menil, AIA, in conjunction with DeWolff Partnership Architects, 2015. After hundreds of hours of restoration work, the City of Seattle Landmark street clock known as the West Earth Co. Clock has been installed at the corner of Dexter Avenue N and Harrison Street. Chuck Roeser of Essence of Time, a clock restorer from western New York, did an absolutely fantastic job. The reinstallation began on March 28 and was completed a few days later. We feel fortunate to have been included in the project as Alexander Real Estate’s historic resources consultant. You can read more about the clock and its 2015 deinstallation here. George explains the concept of a “twin,” two houses built together. George explained that these 1886 Queen Anne style twins—designed by brothers (though not twins!) G.W. & W.D. Hewitt–were typical of smaller houses developed in this area. Lovely 1917 home designed by Edmund Gilchrist, showing Arts & Crafts influences. Vanna Venturi house, designed by Robert Venturi, 1962-64. Esherick House designed by Louis Kahn, 1961. Houston-Sauveur House. This 1885 home is a fine example of a Queen Anne Shingle style. Below is a detail of the “spider” window. A stately colonial house designed by Charles Barton Keen, 1913. What style do you think this is? Mid-century modern homes were built on the grounds of a demolished mansion. Do the Jetsons live here? Lani and Larry Johnson attended the 2016 National AIA Convention in Philadelphia last week. The Pennsylvania Convention Center fills four city blocks and is HUGE! Larry focused on historic preservation and attended a full-day workshop on preservation issues for Modernist architecture. The related EXPO was gigantic, and we learned about all kinds of interesting new architectural products and technology. Along with our friend George Bryant, a Philadelphia architect and historian, we also did a lot of architectural touring. Watch for another post later showing some interesting examples of residential architecture. The Philadelphia City Hall reigned as the largest habitable building in the world from 1894 until 1908. Entry to the Philadelphia Convention Center from Reading Terminal. We traveled to and from the convention center by rail, so this was how we arrived. The main entrance to the convention center totally dwarfs this! Right across the street from the huge, multi-block convention center is this architectural gem: the Pennsylvania Academy of Fine Arts, designed by Frank Furness and built in 1871-1876. Did you know that the oldest hospital in the USA is in Philadelphia? Pennsylvania Hospital was founded in 1751 by Benjamin Franklin and Thomas Bond; the main building was built in 1755. Lani enjoyed visiting Longwood Gardens, an amazing horticultural garden with over 1,000 acres of gardens, fountains, meadows, woodlands, a conservatory, topiary garden, outdoor theater, and other garden delights. This photo shows the Italian Water Garden. The second edition of Shaping Seattle Architecture, edited by Jeffrey Karl Ochsner, is now available in bookstores. The original ground breaking book of architectural biographies and architectural essays was originally published in 1994. This new edition corrects some minor editorial errors, expands on the number of biographies and essays, as well as including short biographies of additional local architects that made significant architectural contributions to our community. Our principal, Larry E. Johnson, AIA, made some contributions to this edition, with additional information on Ellsworth Storey, and short bios of other lesser-known architects who practiced in the Pacific Northwest. We congratulate Professor Ochsner, and his other major contributors, particularly David Rash, for this exemplary academic achievement. Thursday, February 12, 2015, Larry spent most of the day observing the de-installation of the eight-dial Dexter Street Clock, a City of Seattle Landmark officially known as the West Earth Clock. The clock has a long and mysterious history that will soon be covered in another blog post. It has taken several months to obtain the necessary approval, permits, find the right people, and the right time to schedule the job. The clock is approximately 20 feet tall and weighs several hundred pounds. The property owner, Alexandria Real Estate Equities, Inc., brought in Chuck Roeser of Essence of Time, a Lockport, New York, clock restoration company, as well as local street clock aficionado, Captain Paul Middens, USN retired, to guide the de-installation. Local art handler Artech handled all the heavy work, starting early in the morning and finishing up that evening. The bezels, dials, hands, and head came off fairly easily, but presenting a little surprise. The clock dial had the original owner’s name, “M. G. Caplan,” etched onto the dial face, but an attempt was made to hide the name, suggesting the owner may have not been able to make the payments for the expensive clock. As a result Joseph Myer, the make of the clock, had taken it back. After the head had been safely stowed away, the crew worked to remove the Corinthian column mounted above the cast iron base. We did not anticipate an internal steel pipe column, so the outer column had to be lifted vertically, with only minimum mandated safe distances to overhead high-power lines. We all breathed a sigh of relief when the column cleared the pipe. The clock has been stuck at 4:20 for several years. Cody Thomaselli, Chuck Roeser, and Paul Middens (L-R) examining the clock head. Chuck holding Vitrolite dial while TJP’s Howard Miller tries to read the name of the former owner, M. G. Caplan. Not much holding the base down.